Saying goodbye to a career is never easy — deciding whether to leave or stay can be one of the hardest decisions a leader will ever make. 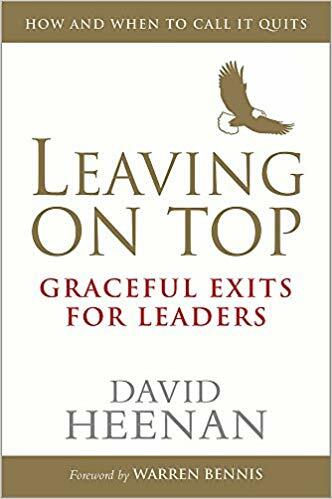 Filled with professional sketches and sage advice, David Heenan’s Leaving on Top: Graceful Exits for Leaders is a rare book that explores this delicate topic. Profiling over twenty top figures in fields as diverse as business, government, sports, and entertainment, Leaving on Top reveals the secrets to excelling in one of life’s most formidable challenges: the graceful exit. Learn from software mastermind Bill Gates and TV personality Oprah Winfrey, who mastered the fine art of quitting at the top of their game by gracefully transitioning into the next phase of their lives. The decision to bid adieu, therefore, should always begin with the question: Will I contribute more today and tomorrow than yesterday? If not, the timing is right to enter the next stage of life. Let Leaving on Top guide you to the next venture in your distinguished career.